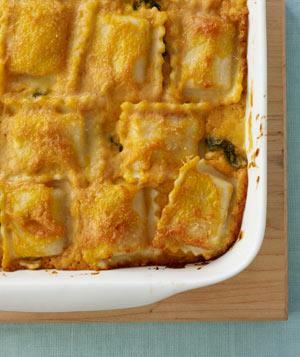 I'm pretty in love with this pumpkin lasagna, and it's always a hit any time I've served it. It would be especially good as a side dish at Thanksgiving, I think, if you're being conscious of your vegetarian guests. This is even easier to make than regular lasagna, because you use fresh ravioli, combining your pasta and cheese in the easiest way! In a large skillet, over medium-low heat, melt 2 tablespoons of the butter. Add the onion and cook for 5 minutes. Add the garlic and spinach and increase heat to medium-high. Cook, stirring frequently, for 5 to 7 minutes. Season with 1 teaspoon of the salt, 1/2 teaspoon of the pepper, the sage, and the nutmeg. Place a layer of ravioli in a buttered 9-by-13-inch baking dish. Top with half the onion mixture and almost half the pumpkin mixture. Top with another layer of ravioli. Repeat with the remaining onion mixture and all but 1 cup of the pumpkin mixture. Top with the remaining ravioli, pumpkin mixture, and Parmesan. Sprinkle with the remaining butter, cut into small pieces. Cover and bake for 20 minutes. Uncover and bake for 15 minutes more. cheese ravioli in a lasagna?!?! genius. Right?! When I read it the first time, I wondered how I'd never thought of it before! Happy 36th Anniversary, Mom and Dad!